Review by AllTheBestFights.com: 2015-02-14, close fight with a pretty good finish: Benson Henderson vs Brandon Thatch gets three stars (UFC Fight of the Night). The black belt in tae-kwon-do and Bjj and former Ufc lightweight champion Benson Henderson entered this fight with a professional mma record of 21-5-0 (52% finishing rate) and he is ranked as the No.4 lightweight in the world but he comes off two consecutive defeats: he lost to Rafael dos Anjos in 2014 (=Henderson vs dos Anjos) and to Donald Cerrone just one month ago (=Cerrone vs Henderson 3). In this fight Ben ‘Smooth’ Henderson makes his debut in the welterweight division replacing Stephen Thompson who suffered a rib injury. His opponent, Brandon Thatch, has an official record of 11-1-0 (100% finishing rate) but he is not ranked as he hasn’t fought since November 9, 2013 when he defeated Paulo Thiago (=Thatch vs Thiago). The only fight lost by Thatch was in 2008 when he faced Brandon Magana (via split decision) and he was at his second pro mma bout. 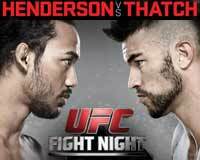 Henderson vs Thatch is the main event of UFC Fight Night 60. Watch the video and rate this fight! You can try to view the gif directly: http://zippy.gfycat.com/AcademicWarmGlobefish.gif.